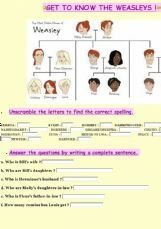 A simple game to review how to talk about family links in English. 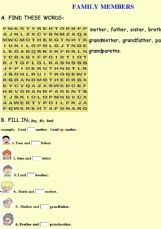 It contains a double puzzle where pupils have to find the correct spelling of words in relation to family. 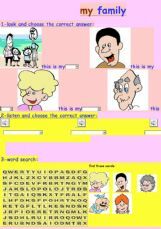 Then, pupils have to do 3 different exercises : a reading comprehension, writing sentences using the genitive case and writing sentences using personal pronouns or possessive adjectives. Depends ! Hope your pupils will enjoy it ! 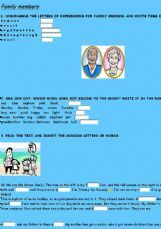 This is an exercise for practising people description or giving opinion. Its vocabulary can be useful if you prepare for your final exam or elmentary language exam. This is a listening exercise that is about family members. There is a short story fragmented in a few sentences. 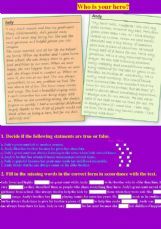 After listening to the sentence, the student must choose the correct option to complete the written sentence. On the second exercise, the student listens and then numbers the family members with numbers 1 through 6 according to what they heard. Have fun! I hope my 6 years old children love it! 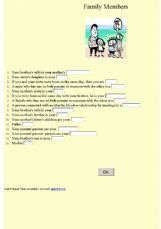 It is a worksheet with 16 defintions of words for family members. The student has to come up with the word that matches the definition and complete the sentence. This activity is recommended for revision. The level of English is intermediate. FAMILY: 1) Find the members of family. 2) Complete the sentences with "my", "her" and "his".